As already stated, the house (See Figure 3) belongs to the woman. She literally builds it, and she is the head of the family, but the men help with the lifting of timbers, and now-a-days often lay up the masonry if desired; the woman is still the plasterer. The ancestral home is very dear to the Hopi heart, men, women, and children alike. After the stone for building has been gathered, the builder goes to the chief of the village who gives him four small eagle feathers to which are tied short cotton strings. These, sprinkled with sacred meal, are placed under the four corner stones of the new house. The Hopi call these feathers Nakiva Kwoci, meaning a breath prayer, and the ceremony is addressed to Masauwu. Next, the door is located by placing a bowl of food on each side of where it is to be. Likewise particles of food, mixed with salt, are sprinkled along the lines upon which the walls are to stand. The women bring water, clay, and earth, and mix a mud mortar, which is used sparingly between the layers of stone. Walls are from eight to eighteen inches thick and seven or eight feet high, above which rafters or poles are placed and smaller poles crosswise above these, then willows or reeds closely laid, and above all reeds or grass holding a spread of mud plaster. When thoroughly dry, a layer of earth is added and carefully packed down. All this is done by the women, as well as the plastering of the inside walls and the making of the plaster floors. Now the owner prepares four more eagle feathers and ties them to a little willow stick whose end is inserted in one of the central roof beams. No home is complete without this, for it is the soul of the house and the sign of its dedication. These feathers are renewed every year at the feast of Soyaluna. The writer remembers once seeing a tourist reach up and pull off the little tuft of breath feathers from the mid-rafter of the little house he had rented for the night. Naturally he replaced it when the enormity of his act was explained to him. Not until the breath feathers have been put up, together with particles of food placed in the rafters as an offering to Masauwu, with due prayers for the peace and prosperity of the new habitation, may the women proceed to plaster the interior, to which, when it is dry, a coat of white gypsum is applied (all with strokes of the bare hands), giving the room a clean, fresh appearance. In one corner of the room is built a fireplace and chimney, the latter often extended above the roof by piling bottomless jars one upon the other, a quaint touch, reminding one of the picturesque chimney pots of England. 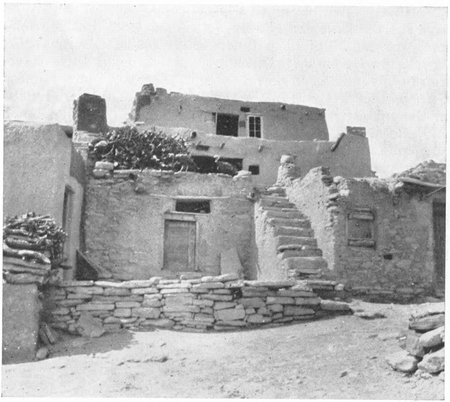 Figure 3.—Typical Hopi Home.—Courtesy Arizona State Museum. The roofs are finished flat and lived upon as in Mediterranean countries, particularly in the case of one-story structures built against two-story buildings, the roof of the low building making the porch or roof-garden for the second-story room lying immediately adjacent. Here, on the roof many household occupations go on, including often summer sleeping and cooking. When the new house is completely finished and dedicated, the owner gives a feast for all members of her clan who have helped in the house-raising, and the guests come bearing small gifts for the home. Formerly, the house was practically bare of furniture save for the fireplace and an occasional stool, but the majority of the Hopi have taken kindly to small iron cook stoves, simple tables and chairs, and some of them have iron bedsteads. Even now, however, there are many homes, perhaps they are still in the majority, where the family sits in the middle of the floor and eats from a common bowl and pile of piki (their native wafer corn bread), and sleeps on a pile of comfortable sheep skins with the addition of a few pieces of store bedding, all of which is rolled up against the wall to be out of the way when not in use. In the granary, which is usually a low back room, the ears of corn are often sorted by color and laid up in neat piles, red, yellow, white, blue, black, and mottled, a Hopi study in corn color. Strings of native peppers add to the colorful ensemble.